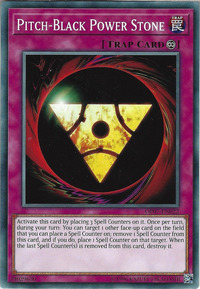 The symbol of a Spell Counter appears on the orb in this card' artwork. This orb appears in the artworks of Mega Ton Magical Cannon, Miracle Restoring, Anti-Spell, and Alchemist of Black Spells. "Tytannial, Princess of Camellias"s effect can be used against Continuous Spell Cards and Continuous Trap Cards which are already face-up. The effect must be chainable, and must target a card on the field. : Can Continuous Spell/Trap Cards be negated with the effect of "Tytannial, Princess of Camellias"? Example: "Tytannial, Princess of Camellias" can be used against "Pitch-Black Power Stone". The three Spell Counters are placed on "Pitch-Black Power Stone" at activation, before your opponent can respond. If "Seven Tools of the Bandit" is chained, then "Pitch-Black Power Stone" is destroyed while it has the three Spell Counters. : At what time are the three Spell Counters placed on "Pitch-Black Power Stone"? If "Royal Decree" is active, the three Spell Counters are still placed on "Pitch-Black Power Stone" at activation. However, the effect of "Pitch-Black Power Stone" will be negated at resolution and the three Spell Counters will be removed. Because of this, you cannot use the effect of "Pitch-Black Power Stone" to move the Spell Counter to another card. : If "Pitch-Black Power Stone" is negated by the effect of "Royal Decree", are Spell Counters placed? If "Pitch-Black Power Stone" is negated by "Royal Decree", then "Pitch-Black Power Stone" will remain on the field meaninglessly. When "Royal Decree" is removed from the field, the effect of "Pitch-Black Power Stone" is reapplied, so you can put Spell Counters on "Pitch-Black Power Stone" by "Apprentice Magician" etc. You place the 3 Spell Counters on "Pitch-Black Power Stone" even if "Royal Decree" is active, so if your opponent chains "Royal Decree" to your "Pitch-Black Power Stone", or chains "Call of the Haunted" to Special Summon "Jinzo", you still get 3 Spell Counters on it. "Pitch-Black Power Stone"s transfer effect targets. "Pitch-Black Power Stone" may itself receive additional Spell Counters from effects such as "Apprentice Magician". You can use a Spell Counter from a card like "Breaker the Magical Warrior" and replace "Breaker the Magical Warrior"s Spell Counter with "Pitch-Black Power Stone" on the same turn (and use "Breaker the Magical Warrior"s effect again that same turn, if you wish). If you have multiple "Pitch-Black Power Stones", each can transfer 1 of its Spell Counters per turn. 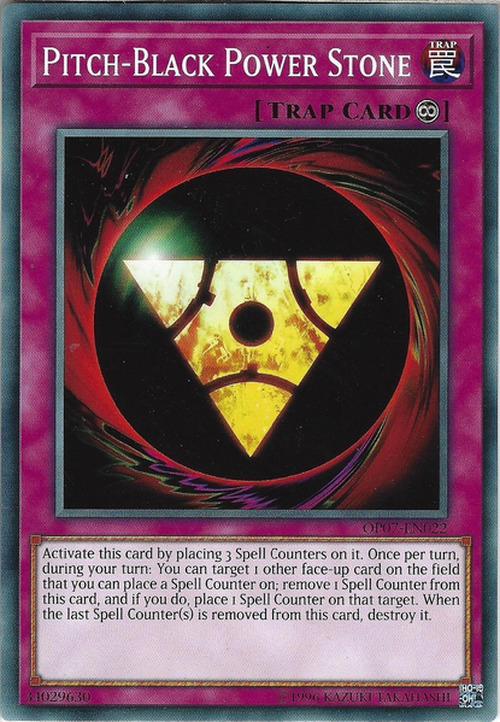 If you have 1 Spell Counter left on "Pitch-Black Power Stone", and your opponent activates "Mystical Space Typhoon", and you chain the transferring effect of "Pitch-Black Power Stone" (a Spell Speed 2 effect), first the transfer effect resolves and the Spell Counter is moved, then "Pitch-Black Power Stone" is immediately destroyed before "Mystical Space Typhoon" resolves. Amplifier"Jinzo with Amplifier", your Trap Cards are not negate"Pitch Black Power Stone"
Breaker the Magical Warrior: You can use "Breaker the Magical Warrior"s effect multiple times in the same turn as long as you can keep re-supplying him with Spell Counters (using "Pitch-Black Power Stone", etc.). Dark Valkyria: While "Dark Valkyria" is an Effect Monster, you can place Spell Counters onto it with other card effects, like "Pitch-Black Power Stone" .